You know how important your logo is, and you've already managed to hack one out - whether it was from Fiverr, your assistant or Canva - you got the job done. But is it working for you? When is a good time to update it? Do you even need to? A strong brand logo has key benefits for your business success. How you’re perceived is everything. Do you look modern and professional? or outdated and amateur? NEWS FLASH - it only takes a couple seconds for someone to judge this about you. 1 - A strong logo tells people what you do and who you do it for. It carries meaning, often on a subtle subconscious level. 2 - A strong presentation leads to a strong perception. Look legit, create trust. In a nutshell? Dress for the job you want. You’re not going to attract high-end clients if you yourself do not look high end. So how do you know when it’s time to redesign your logo? 1 - It looks old, dated, from a specific era, and makes people think they traveled back in time. Remember the 1st websites ever? Trends and tastes change, and that can affect perceptions of your logo. When people see a logo that looks outdated, they perceive YOU as out-of-touch. When you’re selling high-ticket services, the last thing you need to give off is that you don’t know what you’re doing. Rule of thumb? Every 5 years (minimum) your logo needs a refresh. Entrepreneurs evolve faster than your average business. Businesses evolve to survive and stay relevant. Entrepreneurs evolve as part of the work to finding your deeper purpose. Combine the 2 and it’s no surprise you feel like you’re ever-changing. So, if you're not the same business or the same person from a year ago, why do you have the same logo? Maybe your business focus hasn’t changed, but how you present it to the world has. If you’ve recently changed colors or vibes (new photoshoot anyone? ), it’s worth taking a look at the entire brand to make sure you’re in alignment. Rebranding should always go hand-in-hand with updating your logo so that everything communicates a seamless message. Just like your website, your logo creates an immediate impression. Within seconds of viewing, it gives people a perception of your business - and you only get that 1st impression once. A logo is not the end-all be-all of your organization, but, like all your efforts, it certainly makes a difference. There’s no definitive timeframe for a brand update, but if you’re feeling like something’s off and you’ve evolved beyond the “template” look, follow your gut. If you look at your logo design and it just doesn’t feel like it represent who you are —today, at this very moment— then you know it’s time to elevate to the next level. Having a strong image that represents your brand that people can easily visualize? POTENTIAL MONEY IN THE BANK. A generic or dusty old logo that turns people off? Much more likely to hurt your business. I have 2 open spots right now for the woman who knows she's ready for a branding upgrade. 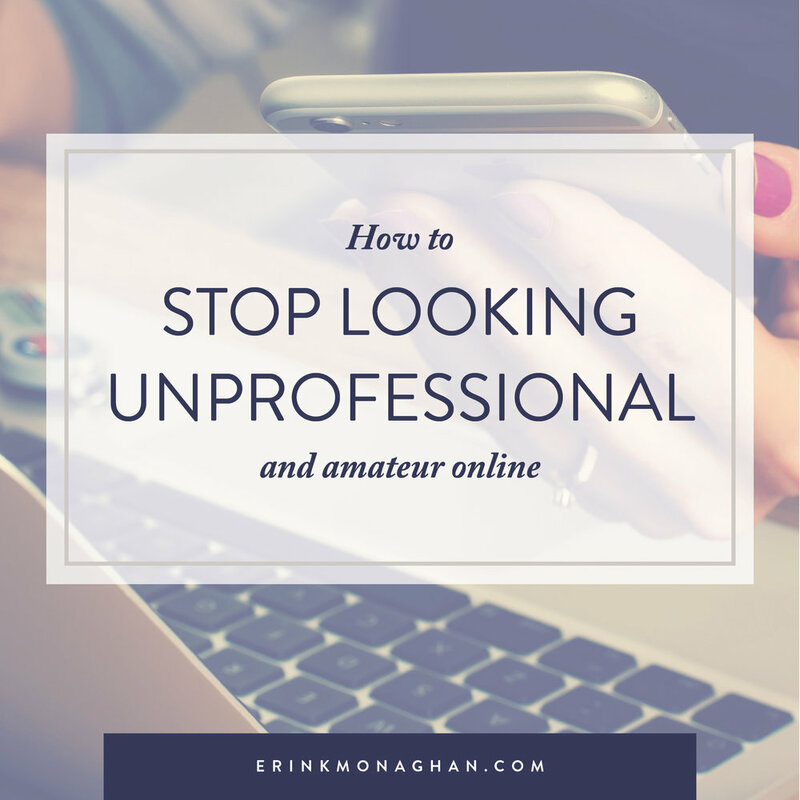 You're tired of doing it yourself & looking less than your best online. What you want most is someone who hears you and brings your essence to the screen. High-quality, anything-but-boring and above-the-rest are my specialty. If you know it’s time to up your game, I’m all ears. I help other industry leaders OWN IT. Reach out. We have no time to waste. CLICK HERE for flat-rate visual branding packages. Sick of looking at your own logo? Gah... what was I THINKING?! Your branding feels gross. You threw something together years ago from a template. Or, you're still trying to bootstrap it with your assistant doing your graphics. You're more than ready for an upgrade because you're tired of looking at what's going on now. If you want to be taken seriously, professional and personalized online branding is not optional. You want to look like the amazing rockstar expert that you ACTUALLY are. Hi I'm Erin & I'm your resident branding expert. I'm here to help you take your branding from lame to LIT AF. I've spent almost 20 years in this industry, and I've worked with everyone from agencies, non profits, big box companies, and most recently, entrepreneurs. Your big goal is to captivate your audience in the handful of seconds you have (2-8 before they lose interest, by the way). So what can you actually do that accomplishes that? If you don't get the branding right on the front end, nothing else is going to work effectively. Step 1 is getting absolutely CLEAR on what you want ... and what you don't want. I just talked to a new client today and ran through my standard questionnaire to help me understand her business better. These questions give me clarity on my client, but they also help YOU fill in some gaps that you might not have thought about yet. I'm sharing my top five brand clarity questions right now to help you start this process on your own. You can use these questions to assess your own business and get super clear on what direction you're going in terms of your brand look and feel. 1 - What are logos / brands out there that you REALLY like? You buy them because of packaging or you always drool over how cool they look. There's a certain style that draws you in. This will give you hints on the aesthetic you're naturally drawn to. Why does this matter ? Because your brand is an extension of YOU and as much as we're going to be making it amazing for the customer, its vibration and essence comes down to YOU and who you are. Branding is a visual representation of you, it's an expression of your deeper self. 2 - What colors do you have in your wardrobe? How about around your house? For the same reason as the previous question, its valuable to become familiar with what you subconsciously surround yourself with. Textures, patterns, certain colors pull us in because they speak to us in some way. 3 - Where do you show up online and how many platforms need branding materials? Do you have a checklist or do you create these on the fly, often missing certain opportunities to show up on brand? We allow ourselves to "forget," become overwhelmed, and therefore come unprepared. Plan it out - how many posts do you do each day? How many graphics are you in need of on a regular basis? How many are static headers that can be done once a month or less? 4 - What words describe you and your business? Voice, vision and visuals (The 3 V’s) are all at play in your brand. You need all 3 working together to have a successful brand that works for you. What is your vision for your business and how would others describe it (voice)? What does their branding (and marketing) look like? What do you like / dislike about their brands? What do they bring to the table and how are you different? The next few weeks I'm going to be talking about the essential assets of your branding: what you need and why you need them. I'll also be touching on extra assets and what they can do for you, and finally, how to go about getting all of this done. If you need help, this happens to be what I’ve mastered over the last 2 decades. Right now til the end of the month my Visual Branding Package is available for TWO business owners only. This is the most popular package option as it includes all the essentials to set you apart and look incredible. The details for the Visual Branding Package are right here. Scroll to the handy chart (looks like the one below) showing you exactly what's included and how you can easily upgrade or get a custom quote to meet your specific needs. I'm basically giving this away. When I worked at an agency years ago, all this would cost you around $20K. There's so much value here to fully upgrade your brand, its insane. Ready to dive in? Click HERE and email me directly. How many more perfect clients would you attract if you had a brand that reflected who you are? That’s the piece that takes you to the next level. Branding is about the impression you make. And it should accomplish two things: what is special about you and your business. Add value and credibility to your services. Visually communicate what you and your business represent. Quit wasting time and money piecemealing mediocre graphics that don’t get results. Time to quit playing small. Reach out if thats something you're ready for. Taking your brand from amateur to pro takes strategy, creative skill, and intention. Knowing where you are right now and how to move into your full potential is key to your business growth. Yes, it matters. A lot more than most people realize. Your branding has the potential to be your best salesperson. Big brands know this fact and invest piles of money to understand the intricacies on a deeper level. As an entrepreneur, you may not know where to start, what matters most, what needs to change first, or even who to reach out to for help. How do you attract the best clients? How do you keep people engaged on your website? How do you convert them with design? If you’re making 6-7 figures in business, but your graphics and website aren’t reflecting the quality you know you provide, then this is for you. You have ONE chance to nail a first impression (online you’ve got 7 seconds to grab their attention). People stalk you on your site and your social platforms before they ever contact you. Potential clients are making snap judgements about you and the value you provide before you even connect. The brain processes an image 60,000 times faster than text. Start using biology to your advantage. You’re leaving money on the table by not capitalizing on how the brain and eyes can work in your favor. What if it could make them stick around instead of leave? What if it was the difference between them becoming raving fans and long-term customers? You can effortlessly increase your prices when your brand quality screams value and people are sucked in to learning more about you. They’ll already know they want to work with you because you look like the expert you are (aka badass extraordinaire). If your current designs are cheaply thrown together with a wing and a prayer, they’re unfortunately going to be perceived that way too. First impressions are hard to reverse. What most entrepreneurs have been told is that they can worry about all the branding stuff “later.” Just get something up there, done is better than perfect, don’t get caught up in the details. Which is a fine strategy when you’re new and have no idea what you’re doing. But now you’re a seasoned pro with a list of clients and business that runs like a well-oiled machine. Your brand is no longer sufficient as just a cool logo and a color scheme. This is your positioning, who you are, being set apart, deserving that freedom, and getting paid what you’re worth. This is how you’re known in the online space and your higher self shining through. Shouldn’t it represent you accurately? Then I have good news for you. High-level custom branding and strategy has the power to help you fix these problems. What do you need to do to look like a top tier brand? Below is my 7-step process that I use with all my clients. Dive in and put it to work on your branding. If you’d like my help, get in touch. Commit to your next level. Are you ready to be seen as the expert you are? Are you ready to look like a million dollars and take your business higher than it’s ever gone? This is a big step for some, and you may not be ready. Fear and doubts, not to mention imposter syndrome can easily show up here. There’s a ton of excuses to not have your brand look this good or put it out into the world yet. When you commit to showing up as the best version of YOU - even the future version of you that you’ve been visualizing for so long - this is where it starts to take real shape. Decide it’s time to grow, not hide or stay small because it’s more comfortable. Choose to elevate yourself to the level you deserve. Gather your team of experts. You already know delegating is a huge part of being a boss. This is no different. You can always skip the next steps and contact me directly as I’ve got all the above pre-assembled for you, ready to dive in. There are 3 V’s in Branding: Vision, Voice and Visuals. The vision is your plans, goals, where you’re going and what you want. Your voice is your message, what you sound like, and ultimately your copy. Visuals are what everything looks like - the tangible part of the brand you create. All three must be in sync in order to get the results you’re after, but the VISION dictates the other two. Which means you need to be really clear on what you want your brand to do for you before you do anything else. Form follows function. If you’re not clear on how you want your brand to operate, the end product won’t work for you. - On your social media platforms? What is the main thing you want them to buy from you? Now that you’ve gotten clear on your vision, you can start to nail down what it looks like by creating your overall brand identity. This will become a set of guidelines you’ll use going forward so everything stays consistent, cohesive, and looks “on brand” (making you recognizable and memorable). This is a great time to think about color psychology - how they trigger emotions, and what they say about your brand. Whoever you hire to help you should have a basic understanding of this science in order to make it work for you. At the end of this process, a set of brand guidelines and standards should be compiled for you. This ensures that you and anyone else on your team can use the same colors, fonts, and other elements in a way that keeps your brand consistent. 5. Map out your website and social platforms. Website mapping is called a framework, or a wireframe. And it’s not as complicated as it sounds. It’s basically a blueprint for how your website will be built and shows the developer how to make it all connect. There are some key components to consider - like not overwhelming your reader with too much copy, strategically placed calls to action and eye-catching photos - but the basics can easily be sketched on paper. All you need to do is think about what pages you need, what each communicates, and how people are meant to flow from one to the other. It also helps you plan what copy and images belong in what place, which will save you time and money down the road. Prioritize what the viewer needs to know and in what order of importance, and use that to guide how you lay out your content. For social media, think about what platforms you use the most. What needs a header graphic, and what does that image need to include? Refer to your brand strategy and vision and think about how your client uses each platform. It’s unwise to simply create a single header image in four or five different sizes and call it a day. Consider each platform’s function and brainstorm how you can use it in the best way possible. This can go beyond header images too. How do you plan to implement your branding on each and every post while still remaining cohesive and engaging? You may want to look at a week’s or month’s worth of content and create a template set. Remember the rest of that team you assembled? Now that you’ve gotten the nuts and bolts of your brand strategy in place, it’s a great time to start working on the copy you need and get an incredible photoshoot done. It should be really easy to knock these out thanks to the branding work you did in the previous steps. You know what copy goes where, you know what kind of photos you’re looking to take, and you know how much of everything you actually need. You also know the vibe you’re communicating and the color palette you’ve decided on, which all influence your photo direction, locations, and the outfits you wear in your shoot. PHOTO TIP: Your photographer needs to understand your images are for online purposes. Be sure to have them include several wide-angle shots with empty space for text. Mix in solid backgrounds (or very simplified) with whatever else you’re including to give your designer room to add text. DO NOT hire them if they plan to “photoshop it” later. It never looks right. The best part is seeing it all come together. Your brand is coming to life! However, don’t check out of the process quite yet. You did your due diligence when you hired your team, but you’re still the decision maker and they need your input in order to do the very best job. Make sure you’re on the same page with each person on your team so there’s no surprises later. Over-communication is never a bad thing and it’ll make it easier on you later. Different browsers are tested with web and social platforms. Online interface changes constantly, so it never hurts to be double check. Your links to other pages and calls to action buttons are working and accurate. You’re able to make quick changes on the back end of things so you don’t have to hire someone for every little typo or image swap. Use this list to prevent worst-case scenarios from happening in your branding process. Always keep in mind, if you wouldn’t hire the cheapest electrician or plumber to fix your house, don’t do the same for your business branding. If you’re sick of looking at your sub-par website, knowing your branding is less than it could be. If you’re tired of feeling less valuable because your look just doesn’t excite you anymore. If you’re ready to be first in line instead of second-best. Then it would make sense for us to chat and see how I can help. Click here to schedule a call and start the process. Can a font REALLY portray a personality? Does it ACTUALLY speak to who you are? Aren't we really getting nit-picky over something insignificant like the shape of an E or a T? Little known fact - Your font is kinda everything. You don't realize it because you see type everywhere all day long, but there's a science behind fonts and how they make you feel. Ever notice how different websites make you feel while you're reading online? If you've never noticed - try it now. Look at this article on Medium vs. this one on Cracked. What did you notice? How did you feel? When selecting a font, there's a 100% guarantee that you rely on its aesthetic virtues. It's a subconscious thing, which is why we pay no attention, but we know if it feels good (we keep reading) or crappy (we find something else). Here's another trick that proves it. Open one of your recent text documents, select everything you see and change the font to Times New Roman. Take a moment and realize how the page feels, and now change the font to Arial. Do you feel anything? Seems like the whole text presentation turned less formal and spacious, doesn’t it? You can do this trick with any other font you like. Play with it on your website and see how it changes the entire vibe. So why do we feel this way? It's all the same alphabet, after all. First things first -- It's all about the AUDIENCE. Remember when you were younger, you could go to a concert at 11pm on a weeknight and stand there in front with hundreds of other people for hours waiting for the main event? You didn't flinch. It was cool. You wanted that experience. You wouldn't be caught dead out past 9pm even on a weekend, you get there early enough to get the few seats they've got, and omg can we go somewhere quiet because I can't even hear myself think!? Different audiences want different feels. When we read, our eyes follow a pattern called a Scan Path. Our eyes break sentences up into scans and pauses. And in between, our brains take snapshots of the letters, arranging them into words, and then parses out the meaning all in a fraction of a second. Because understanding the way we read is important for designing how words look because you can directly impact someone’s connection to your writing with the right font and layout. Which can mean the difference between someone getting immersed in your content... or not. Psychologist Kevin Larson spent his career researching typefaces and conducted a landmark study at MIT about how font and layout affect our emotions. They ran experiments with separate versions of the same newspaper - one with a well-designed layout and one that was designed badly. Bad design makes people grumpy and frown a lot. Good design makes people more focused, efficient, and clear. Your anchor font is the one people will see the most of. This will most likely be your body copy. Every other font will be based around this choice. Serif Fonts – Letters with short lines coming off the edges. Viewed as more formal and traditional (Think Times New Roman). Best suited for print copy blocks. Sans-serif Fonts – Letters without serifs / lines. Viewed as informal and playful (Think Arial). Best suited for digital copy blocks. Script Fonts & Decorative fonts are not ideal for body copy simply because they make it hard to read. Especially on the web. Anything hard to read is a sure way to get people to leave your page. Don't make people work to read your stuff. Unless you're writing a printed book piece or a research paper, the old rules of 12pt font do not apply to computers. Use something 16pt - 22pt for body copy. A recent study has also shown that larger font sizes can elicit a stronger emotional connection. Give it a go and see if you feel a difference. Spacing on the margins, spacing between lines, AND spacing between letters all matter. The line length is how far your sentences stretch across the page (and conversely how much margin is left blank). The ideal line length should be about the width of a book - 6ish inches. Too long or too short makes it all too hard to read. More questions about fonts? This is just the tip of the iceberg (I know), so I'm here to help if it all feels like a lot to take in. Just shoot me an email and we can rock this out for you in no time. PS - I created a huge 34-page branding guide to help you get clear on what you need to do to take your business to the next level. It’s totally free and includes my entire process I use with my clients. Check it out HERE. I've always hated having my picture taken. Its not that I couldn't make the right face or my hair was stupid. I just hated the entire room looking at me. It's ironic because running a biz means you ARE the center of attention. There's no way around it. But I still had reservations. When it came time to get professional photos done, I was a mess. I didn't know what to wear (I live in yoga pants). I didn't know how to stand. What if I looked totally awkward? Basically, I didn't want to lose money for bad photos and end up with nothing I could use. I'm here to help you navigate this minefield of anxiety. Through a lot of research, over-preparation, and asking my photographer a bajillion questions, I ended up with some awesome photos that I'm really proud of. 1. Do the branding work first. There is no point in even starting the photo shoot process until you know what this is all going to look like in the end. Otherwise you risk having to reshoot, or a set of images that don't really compliment your hard branding work. (If you haven't figured out what your brand is going to be yet, check out this guide I created to help you nail it down). Before you go hiring ANYONE... hang out on Pinterest. Not sure what you want your photos to look like? Pinterest is your lifesaver. This is where I got ideas for props (I used balloons), color schemes, what other people were wearing, how they stood, etc. Make a board of everything you like. Especially poses - because you can share these with your photographer. You're not bossing them around. It helps them, just like you might save photos of a hairstyle you like to take to the salon. The clearer you are on what you want, the easier it will be for them to give you exactly that. Send them outfit ideas, posing ideas, even location ideas (more on this below). 3. Finding / Hiring your photographer. I cannot stress this enough, find someone you LIKE! Ask for referrals, google people that understand online business. Look at what your entrepreneur peers are doing - who did they hire? How did they find them? Some photographers will travel to you, others will not. You're also free to choose some exotic location and go there! Look locally to save on airfare and hotels. Stalk them online. You need to like their style of photos. It will look similar for you, so if you're not diggin what you see, keep searching. Have a conversation with them. TELL THEM you feel uncomfortable and anxious (its way normal). TELL THEM You make awkward faces sometimes and you're worried you might do it again! Part of their job (if they're worth their salt) is to make you look good and help you relax! They'll have their own ideas for you. Ask them for advice. They do this all day long. They know what colors / styles / locations show up well and which ones don't. It may not be super specific to your brand, but they can give you guidelines on what to do to make it look amazing. Heads up: your photographer already has places they like to shoot (unless they're traveling). They've scoped them out, they know the lighting, it works for them. That being said - if you're wanting urban, city-life images, find someone who has those examples ready. If they're someone who only shoots in wide open fields, then maybe they're not for you. Do the branding work before you decide, because the backgrounds of your photos matter too. See what Pinterest has to offer you in terms of looks / vibes. And then have the conversation with your photographer about what you want. They should be clear about where they will / will not shoot. This should go without saying , but your props and outfits should be cohesive with your brand (If you haven't figured out what your brand is going to be yet, check out this guide I created to help you nail it down). Colors should coordinate. You don't have to be matchy-matchy, but a pop of your brand color that you wear in some way will make the photos tie into everything else you're doing. For instance, you wouldn't wear red heels if your branding color palette is muted pastels. But you might pull in a deeper shade of purple as a necklace or jacket. Style should be cohesive. If your branding is BOLD colors and fonts, then your style should be too. If you did the branding exercises right, this should be easy because you've created something you're naturally drawn to anyway. If your style is relaxed and soothing (think a beachy feel with nice blues and greens), then you're not going to wear a suit. Instead, you pull out the flowy dresses and linen. Same with props. And you don't need a lot. Pick one big one (like my balloons) that can be the focal point, OR some smaller ones that work indoors (notebooks, coffee mugs, your laptop, etc). Maybe it's your pet or your family. Whatever it is, be sure it makes sense with your brand messaging. Your photographer can also tell you how many outfit changes are possible in the time slot you've scheduled. 2-3 outfits/changes is usually the max. If you're feeling really stuck, look into hiring a stylist to help you out. They know body types, coloring, and will help you look amazing. Just like your photographer, find a hair / makeup person that understands photoshoots. Someone that does this for weddings is a good bet because they get the desired balance of looking like yourself and also looking amazing in pictures. I'm all for authenticity. Truly, but in the same way that stage actors must wear makeup to simply to be SEEN from the audience? The rule applies here too. You can have it all done in a natural look that still looks like you. You don't have to have crazy big hair unless you want it. No need for glitter lips (unless it makes sense for your brand). I promise your photos will come out way better if you are willing enhance your features. Minimum? Fake eyelashes (not kidding) and lipstick. Do your research, ask for references or at least a portfolio. There's a good chance your photographer will already be connected with great people and work with them often. Which means you get to see how their work shows up on camera. Win-win. 7. The day of the shoot. You're wondering if everyone else can tell your hair is as big as Texas. You're hoping for the best. You're just now realizing how far out of your control this really is! Remember you did your research. You put your trust in them. Your props (if you've got them) will look so great. My secret trick (and it's not for everyone) is to have a drink right before your shoot. And then simply be in communication with your photographer the whole time (you probably have been already via email and you're like friends now). It's their job to direct you. Don't be afraid to ask questions in the middle of pictures. "This feels weird. Am I standing right? Can you see my double chin?" You cannot do this wrong. The prep work alone will make you feel like you've got it under control. 7. Have FUN and enjoy yourself. Feels overwhelming still? You don't have to orchestrate all this alone. I can help - just reach out!